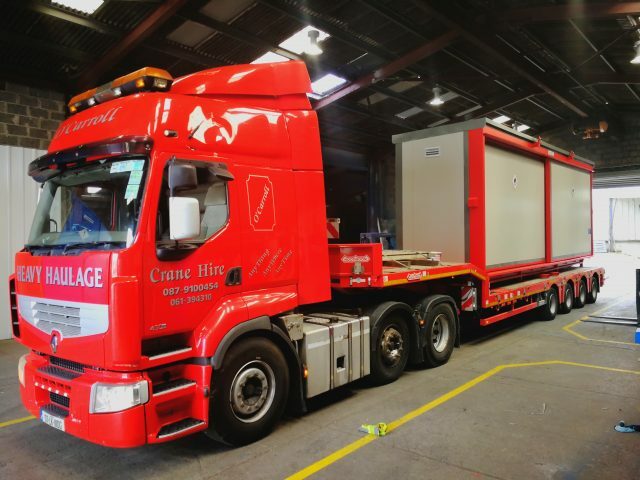 The initial inquiry came in March 2017, where the client requested an inspection of an already existing Firevault on site.The client requested Chemstore to quote the cost of dismantling an existing Firevault while also relocating it to another external area of the site. During the site visit in March 2017 by our Technical director David O’ Carroll, it was found that substantial damage had been done to the doors of the existing Firevault. Our Production Manager Kevin Ryan visited the site again in April 2017 to review the work involved in dismantling & reassembling the Firevault. As a part of the overall quotation Chemstore gave an option of providing two new 48 DSD Firevault Stores as an alternative option and recommended using the existing Firevault as additional shelving. After this was suggested our client decided to go with our recommendations to leave the Firevault in position and remove the damaged doors, allowing for extra racking for internal pallets on site. 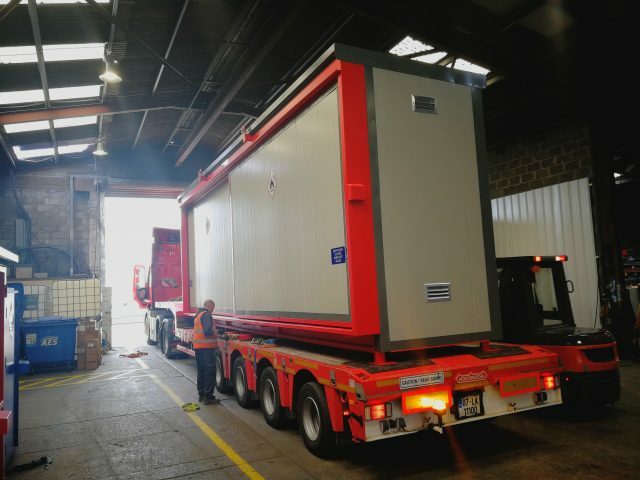 The client then ordered two 48 DSD Firevaults to fulfill the external flammable storage requirements onsite. The two Firevaults are manufactured with a 90 minute fire rated wall. The stores are fully bunded, tested and certified. 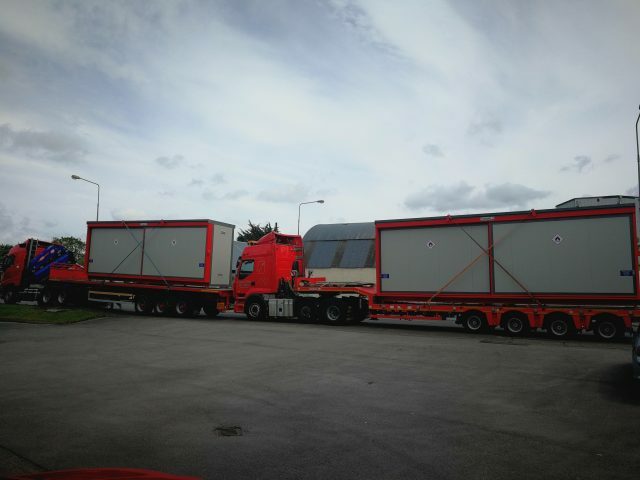 The two levels allow for up to 12 IBC’s of flammable material to be stored. The twin sliding doors running on a heavy duty slide mechanism allow for easy forklift access. The doors are fully pad lockable complete with a vandal proof shroud. 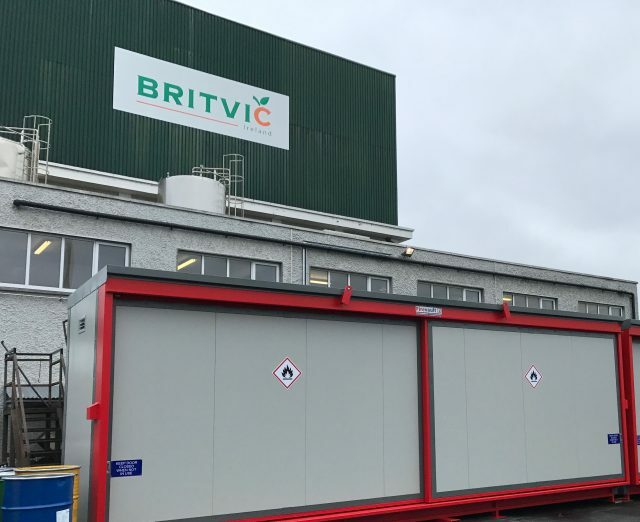 The video below shows the Firevaults leaving our manufacturing facility and arriving to the Britvic site. If you have any queries on your hazardous material storage on site you con find our contact details here.